Darts star Rob Cross dropped a place to third in the Unibet Premier League after recording his first draw in the competition last night (Thursday). The St Leonards-based world champion had to settle for a 6-6 draw against world number two Peter Wright at Rotterdam Ahoy having at one stage enjoyed a healthy 5-2 lead. 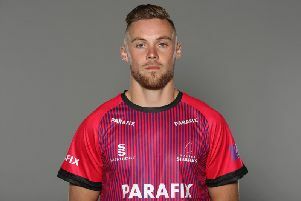 Cross played very solidly during the opening seven legs, hitting a number of 100-plus scores and finishing superbly, but went off the boil thereafter and allowed Wright back into the match. The world number three checked out 81 for a tremendous 12-darter in the opening leg and broke the throw in the second leg by finishing 58 after Wright missed four darts at a double. A 177 followed by double six for a 13-darter made it 3-0, and although Wright hit a 180 followed by a 97 checkout to pull one back, Cross pinned 88 to go 4-1 up. Wright produced a 13-darter to make it 4-2 despite Cross’s first 180, but Cross responded with a 13-darter of his own in the next leg, at the end of which he’d hit five of his six attempts at a double and was averaging 104. Wright, however, reeled off the next three legs to level at 5-5. He finished 61 in the eighth leg, punished a slack leg from Cross to break back in leg nine and although Cross landed his second 180 in leg 10, Wright finished 65 in two darts. Cross hit his third and final 180 in leg 11 and eventually won the leg with his seventh dart at a double. That put him 6-5 up and guaranteed him at least a point, but Wright then hit his second 180 followed by a 58 finish in two darts to earn a share of the spoils. The Premier League is a 16-week roadshow competition involving 10 of the sport’s top players and Cross remains on course to finish in the top four and thereby qualify for the competition-ending play-offs. Night 13 will take place in Manchester next Thursday, when Cross will face five-time world champion Raymond van Barneveld. Unibet Premier League standings (played-points): 1st Michael van Gerwen 12-18 (+34), 2nd Gary Anderson 13-17 (+19), 3rd Rob Cross 13-17 (+10), 4th Michael Smith 12-16 (+24), 5th Daryl Gurney 13-13 (+1), 6th Raymond van Barneveld 13-12 (-12), 9th Peter Wright 13-11 (-17), 10th Simon Whitlock 13-10 (-17).